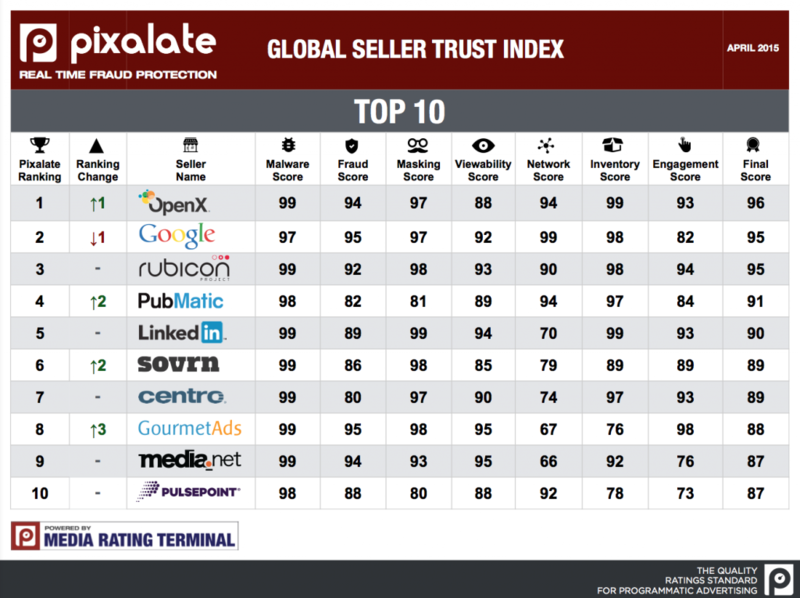 OpenX has overtaken Google as the most trusted inventory source, according to figures released this week, as the latter of the pairing aims to underline its leadership in the industry’s fight against dishonest players. 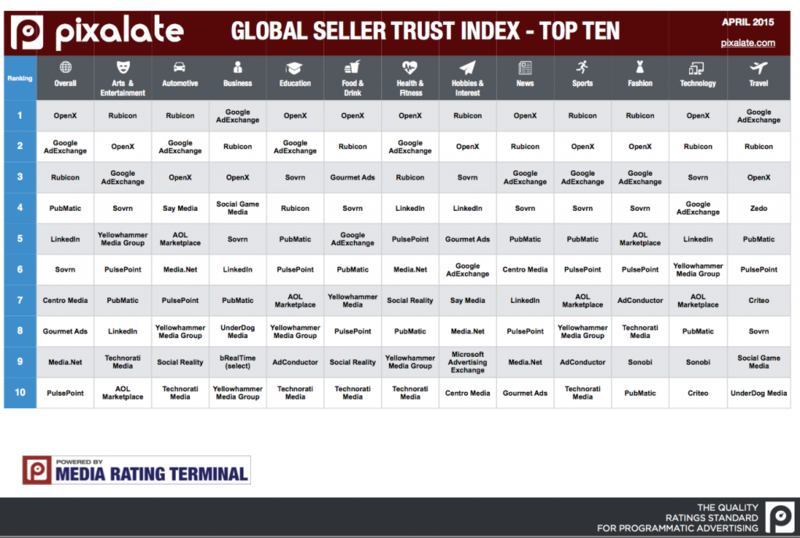 The claims were made in the latest update toPixalate’s Global Seller Trust Index (GSTI), which ranks inventory quality and security risk, with the company further revealing that 70% of media inventory sources are exposed to malware-driven ad fraud, with one-in-20 internet users infected by it. Overall, OpenX ranked as the most highly-rated source of traffic in April, overtaking Google AdExchange, which had led the table the previous month (see chart immediately below). Meanwhile, both OpenX and Rubicon Project are leading in five categories each, while Google’s AdExchange leads in two (see chart below). Commenting on the numbers, Jalal Nasir, Pixalate, CEO, said addressing the issues of cyber security risks, plus the concerns they pose to both enterprises and consumers, was crucial if high-level marketers are to place further trust in programmatic media buying. The complexity of the programmatic advertising sector means it is particularly vulnerable to malicious players in the ecosystem, as it gives them a means to hide their true identity, according to Nasir. Pixalate’s GTSI analyses 100 billion ad impressions, across 350 million IP addresses in order to benchmark 400 programmatic media sellers by assessing their vulnerability to darknets, owned and operated by malicious organisations. The latest version of the report also revealed that breaks sellers down by IAB verticals (see chart below). Meanwhile, Google has been at pains recently to demonstrate that it is at the vanguard of the drive to clean up ad tech, post its purchase of Spider.io last year. The advertising behemoth recently granted industry journal Ad Age access to its 100-strong anti-fraud team in London to offer the industry further insight to its efforts to combat botnets, which are credited as siphoning off $6.3bn from the digital advertising sector each year. The piece demonstrates the ease with which hackers can hijack machines – through security weaknesses it calls ‘exploits’ – to create botnets that then click on ads en masse, and further profiles Google’s efforts to combat the fraudsters behind them. More recently, Google used its DoubleClick Advertiser blog to issue a call to action in a post entitled: Stopping Digital Ad Fraud. Penned by Vegard Johnsen, Google, ad traffic quality, product manager, the piece echoes Google’s backing of the IAB’s efforts to standardise industry jargon around such practices. Johnsen goes on to advocate a system whereby any party that purchases non-blind impressions should be passed a chain of unique supplier (and reseller) identifiers – be it an exchange, network, sell-side platform – and one for the publisher. Mikko Kotila, industry veteran, and author of last year’s WFA report advising brands on transparency in the programmatic buying sector, recently dropped by the ExchangeWire office to discuss his not-for-profit outfit Botlab.io, aimed at helping clean-up the sector. In the TraderTalk TV episode below, Kotila discusses his view that independent bodies are better placed to combat fraud, compared to security firms or trade bodies, as the latter are incentivised for profit. Here are some really interesting facts about the online advertising, Enjoy!.